Setting up a View with a bulk operation to modify the entity in question is pretty straightforward. The one 'catch' at this point is that as far as VBO is concerned, we have to enter the CiviCRM 'value' not the 'label', so if you are wanting to update a Participant Status to attended you need to know that is a '2'. So in this case the use case was that an invite had gone out from civi, some had responded and had been set to a Status of 'RSVP-yes', others had not responded and were hence still Status of 'Invited'. The View then provides the client with a simple interface where they can tick off names as they come to the event, and at the end of the evening, set them all to 'Attended'. You can see a longer explanation with many screenshots etc here and grab a txt version of the View from here. 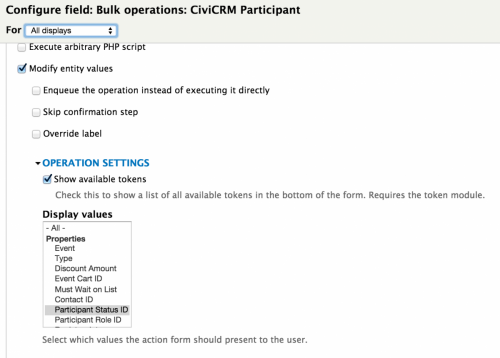 A screenshot of the way to set up the VBO field is below. In this situation we needed a bulk updating interface for Relationships so that relationships can be set to inactive along with the End Date. Eileen has set this up as a Feature you can try out here.